SPECIAL ORGANIZING SPECIAL JUST $14.00! So much is in the news about organizing! In the book, the Art of Tidying Up, there is a section about organizing your photos and we agree! One area that is mentioned is having a system in place and that is where most people fail – they don’t know how or where to start. We’ve taken that guesswork out and made it simple. 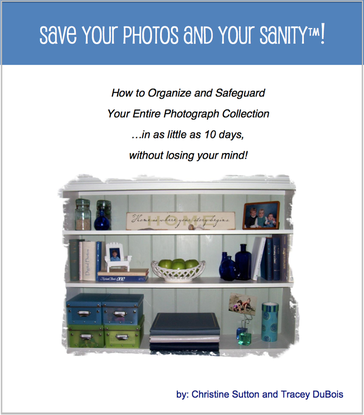 Our ebook called Save Your Photos and Your Sanity™ is a step by step guide that takes you through a journey from disorganized to organized with your photos in 10 days or less! Imagine the huge sigh of success as you cross that item off your list! Because we value you as a subscriber – we are offering our Save Your Photos and Your Sanity™ at a 50% discount! You can get started today and reap the rewards as so many who have purchased our ebook in the past. I’ll share some of what you will learn. There are typical organizing steps that may actually do more harm than good! Does this sound familiar to you? ​We dedicated two years to uncovering every tip, every secret, every possible method for simplifying the process of organizing and preserving our precious photographs and memories. We’ve made it so easy to follow in a 104 page ebook format. You also get to enjoy our 100% ironclad money-back guarantee! If for any reason you are not satisfied you can return the collection and keep the five Special Bonuses free of charge! That’s a guaranteed gain no matter what you decide!